Right out of the gate this movie suffers from a major handicap: the suspension of disbelief that it requires as it relates to its casting is bigger than the size of the brood that is apparently supposed to be the major selling point of the film. Am I really expected to believe that the queen of sophisticated screwball comedy Myrna Loy would really let Clifton Webb touch her once, let alone a minimum of twelve times? Bickering with William Powell in between solving murder cases, I can buy, but any interaction with the snooty Webb beyond a polite “how do you do” doesn’t really ring true. That the movie sought to portray its domestic chaos with such a pair could be easily forgiven if the material they were working with was good enough to allow us to forget this ultimate odd coupling. 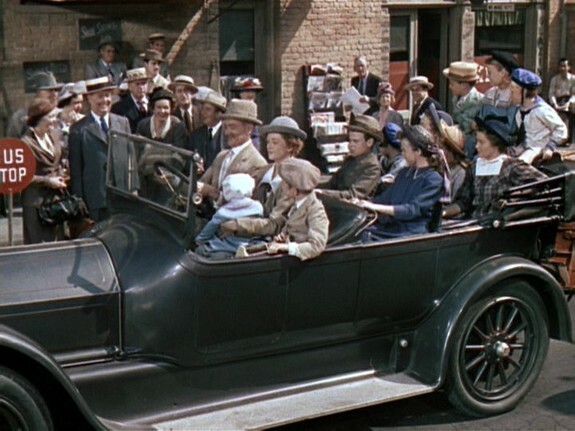 Unfortunately for us (and probably even more so for the real-life family this film was based on), the episodes detailed here are entirely unmemorable and come across as just a bunch of unconnected events involving the Gilbreths. The movie opens with the Gilbreths finding out that Frank is going to be moving them from Providence, Rhode Island to Montclair, New Jersey. You can imagine the screaming horror that resulted as the children came to the realization that they would be living in the Garden State. That was the one part of the movie that would ring true with anyone. After a rather tired gag involving all the Gilbreths having to go to the bathroom a mere half hour after Frank had already asked everyone, they finally get to New Jersey and realize that with their big house their two servants aren’t going to be able to keep the household up as they would like, so a family council is convened where the chores can be divvied up. What a stirring demonstration of the American spirit of self-sufficiency that these 14 lazy asses somehow manage to get by with only two servants. Why, Frank actually had to *gasp* pay one of his sons to white wash the fence! In the history of Man there have been exceptional examples of his indomitable will to triumph over the most trying of circumstances, but I think we can agree that these Gilbreths set a standard that those of us with three or four servants could only hope to aspire to. The movie though isn’t just about how this family rises to the occasion when it’s gut check time. There’s also Frank’s never ending quest to make things more efficient. Thankfully, the most efficient thing was the movie’s 85 minute running time, but unthankfully it spends an inordinate amount of it detailing Frank’s efforts to film the tonsillectomies that he and his kids undergo in an effort to gather information to make future operations better. I understand that these kinds of movies thrive on the dad looking like a dunce, but this is one of those kind of things that even a doormat of a wife would put a stop to, or if not, the doctor surely would. Frank has all the operations set for the same day (as a parent, would you really want to deal with eleven or so kids that are recovering from surgery simultaneously?) and all them are taking place in his living room! It just doesn’t work on any level and certainly isn’t funny, even when Frank gets an unexpected surprise at the end of it all. 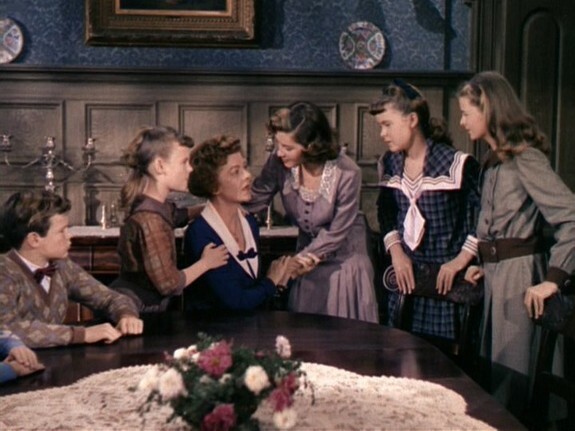 Frank spends a good deal of the movie clashing with his oldest daughter about the usual things – boys, clothes, make-up, and whether she can cut her hair. 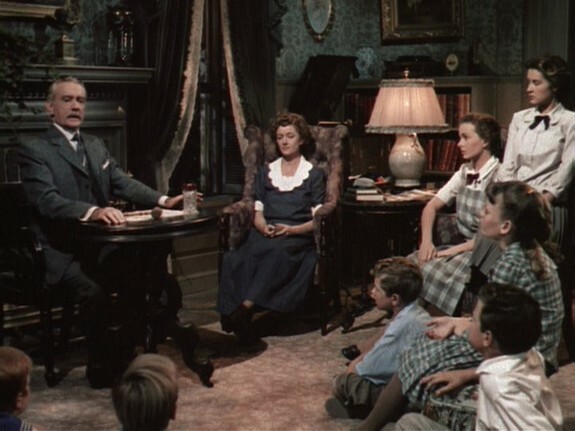 That the daughter is played by Jeanne Crain only allows us to revisit the whole “woeful miscasting” issue mentioned previously. 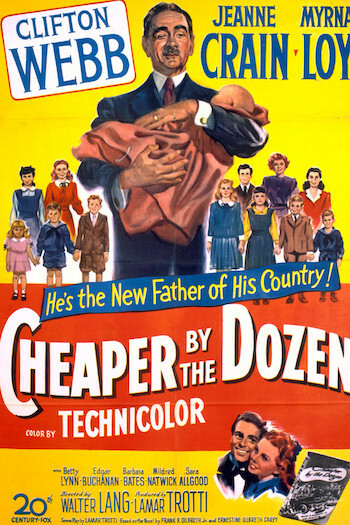 Made in 1950, Cheaper By The Dozen comes a year after Jeanne starred in A Letter to Three Wives. That film featured Crain as a married woman worried that her husband ran off with someone else. And now I’m supposed to find it believable when she defiantly trims her hair and argues with Webb over whether she can wear a bathing suit that shows off her knees? None of the other kids exist in the movie other than to fill out the slots necessary to make up the dozen. A sequel (Belles on Their Toes) followed, but after watching this weak exercise in family comedy you’d be hard pressed to get too excited about it.